Perhaps you’ve heard of the athletes who refuse to go to the Olympic Games out of Zika fears, or maybe you read about the threat of Zika Virus in the newspaper. The undeniable truth is that the Zika Virus is quickly making its way to American shores and has the potential to infect some of our most vulnerable citizens. Just this week, the CDC issued an unprecedented travel advisory for a Miami neighborhood due to an outbreak, the first time the CDC has issued such an advisory in the United States. Although Zika is a popular buzzword thrown around by media pundits, it’s important that we do not underestimate the severe effects of the virus on certain subgroups. It’s imperative that we take an active role in preventing our friends and loved ones from contracting it. Even though stories about the Zika Virus receive almost daily media coverage, very few Americans know the actual symptoms of the virus and are able to adequately assess their risk. The tricky thing about Zika is that its symptoms may seem like any other sickness. Those infected often experience fever, rash, joint pain, conjunctivitis, muscle pain, and headache. 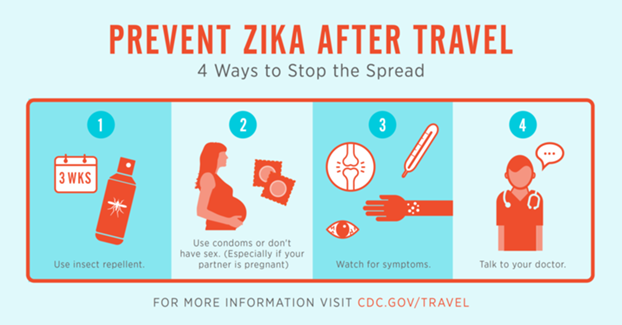 Those at highest risk are pregnant women who can pass the virus to the fetus, causing the baby to potentially be born with a variety of birth defects including microcephaly..
How do you prevent the spread of Zika? Because the primary cause of infection is mosquito bites, it is imperative that one take all the necessary precautions to avoid being bitten by mosquitoes. Wear long sleeve shirts and long pants outdoors and always use insect repellent to protect yourself from mosquitoes outside. When inside your home, make sure to eliminate breeding spaces for mosquitoes, including any stagnant water. Zika can also be spread through sexual contact, so it is essential that men always where a condom when engaging in sexual activity to reduce their risk of contracting or spreading the virus. For Latino Zika Week of Action, LULAC is partnering with other Latino organizations, the CDC, and the U.S. Department of Health and Human Services to ensure that the Latino community has all the necessary information to adequately assess their risk factors and take the necessary precautions to protect themselves. Together we can stop the spread of Zika and lessen its impact in our country. To learn more, visit www.cdc.gov/zika. Geoffrey Nolan is a Communications Associate at LULAC National. He graduated from the University of Georgia, where he majored in International Affairs and Spanish. Since its founding 87 years ago, LULAC has fought to ensure that Latinos are not left behind as our nation progresses. As the Latino community continues to face obstacles, LULAC will continue to fight on our behalf, but some other communities are falling behind and are fighting the same fights that LULAC fought almost one hundred years ago. One of these communities is the LGBT community, and even today LGBT individuals can be fired from their jobs in twenty-eight states due to nonexistent employment non-discrimination laws. The ACLU is currently tracking legislation in twenty-five states that make it effectively legal to discriminate against the LGBT community and would even allow continual federal and state funding to organizations that discriminate against the community. Despite this, on June 26th, 2015, the LGBT community across the country celebrated the Supreme Court ruling on Obergefell v. Hodges which expanded the right to marry to all United States citizens. Celebration was followed by a disappointing streak of legislative backlashes. On March 23, 2016, the governor of North Carolina signed a bill that prevents individuals from using the bathroom of their gender identity. On April 5, 2016, the governor of Mississippi signed a bill that legalizes discrimination against the LGBT community by allowing businesses and individuals to discriminate against the community based on religious freedom. On May 19, 2016, the U.S. House of Representatives voted to allow federal contractors to continue discriminating against LGBT employees on the basis of religious freedom. Anti-LGBT sentiment culminated in the tragic events of June 12 when a gunman entered Pulse Nightclub’s Latin night and killed forty-nine members of the LGBT community and injured another fifty-three people, making it the worst mass shooting in the history of the country. We cannot outlaw hatred, but we should not legalize it. When I was young I used to watch Mr. Rogers. He once said, “When I was a boy and I would see scary things in the news, my mother would say to me, ‘Look for the helpers. You will always find people who are helping.’” As a community, we can look at others fighting the same things we fought decades ago and decide if we are going to be the helpers or if we are going to be bystanders. LULAC stood with the LGBT community through Don’t Ask, Don’t Tell and the fight for marriage equality. We must continue to be allies to the LGBT community now and ensure that their rights continue to be protected.